Everyone, of course wants to rent to the best tenants. However first attracting, screening and then selecting the best rental tenants isn’t easy. And if you make the wrong decision while choosing tenants, you will certainly find yourself in hot water. There can be a variety of issues when landlords feel that the tenants aren’t right such as property damages, rent payment irregularities or simply noise pollution. Evicting bad tenants can be a nightmare. So, let’s find out what are those exclusive tips and tricks that lead to finding, screening and selecting the perfect tenants. No matter how badly you need extra income, the first tip towards getting the right tenants is to be a calm, composed and rational landlord. Never rush things through even if you feel tempted to taking on the first applicant who comes to you. Hasty decisions often lead to regret and then a series of compromises on your part begins. Plan well in advance; if your existing tenants are about to leave then you should plan before their agreement expires. Advertise about the room/portion/house at the right media platforms and keep your criteria fixed. Such as, if you are looking to rent to a small family then stick to that. You need to have variety in choice; therefore, it is a better idea to go all-out while advertising about your property for renting. Spread the word in the neighborhood, publish ads in newspapers and use social media for this purpose too. If you are renting through an agent, you must be informed about the methods being used to find tenants for you. Check what kind of descriptions/photographs are being shared and as the landlord who knows your property best, always write the ad yourself. Don’t just sit around after publishing the ad or hiring an agent but you should be proactive enough to keep yourself engaged and informed about whatever is happening. Of course, your phone will be flooded by enquiries but if you also try to find out prospective tenants by going through adverts from property seekers in your area, you may just find the right one. Renting out property is a tough task indeed; you need to have peace of mind in the end from both financial and property fronts. To ensure that you don’t face issues later on, run some background checks on your chosen applicant. The idea is to make sure that you are being told the truth. It doesn’t matter if you are a landlord renting for the first time or have been doing so for long; many landlords make the mistake of taking on the new tenants hurriedly just to fill their empty property and keep the cash box ringing. This is not the right approach; do your homework and always follow the legal procedure prior to handing over the keys. Do get information about what are the agreements to be signed, what is the current rental rate of your property and what are your rights and obligations as a landlord. Be expressive and discuss everything in detail with the applicant(s) and ensure that they are aware of their rights and duties too. Check References: For any landlord cross-checking references is a vital task to be accomplished prior to signing the tenancy agreement. Many landlords make the crucial mistake of simply collecting the references and they never verify the information from reliable sources. This is a grave mistake. You must check the references provided by the applicant as his or her guarantee. These must include checking out legitimacy of information about previous and current employments by calling employers, previous accommodations and consulting previous landlord (if any) etc. Credit Checks: Never trust any tenant as if you have known him or her right from the beginning. Even if the tenant has come from your neighborhood, you need to verify all the information provided by the applicant including credit related information. This is an important aspect to be screened before renting your property; you need to run credit checks to make sure that the prospective tenant will be able to pay the rent in the long run. This is, however, a sensitive issue and you need to ask for the consent of the applicant prior to checking. You can ask for bank statements too but don’t think that if the tenant is reluctant then there must be something fishy. They might just be feeling uncomfortable sharing their financial information with a stranger. Maintain your property well: To get the right tenants, you need to offer the perfect property as well. Good families look for clean, well-maintained properties to rent and if yours is not up to their standards, you may have to wait longer for the right tenant. Keeping your property in decent, presentable conditions is the key to finding good tenants. It doesn’t have to be loaded with luxurious furniture or high-end appliances the basic idea is to keep the property tidy, maintained, equipped with all fittings and fixtures and basic necessities like hot/cold water, uninterrupted electricity and preferably security systems. Don’t forget the Deposit: Taking a rental deposit from tenants is very important for the protection of your property and to be sure that you will be having a month’s rent already if the tenant turns out to be unreliable or vanish without a trace after some time. You will have maximum peace of mind that your property will be maintained by the tenants since you can always deduct expenses on repairs that the tenants refuse to pay. Remember that it is your legal right to take deposit from your tenants and this has to be a month’s rent in full. 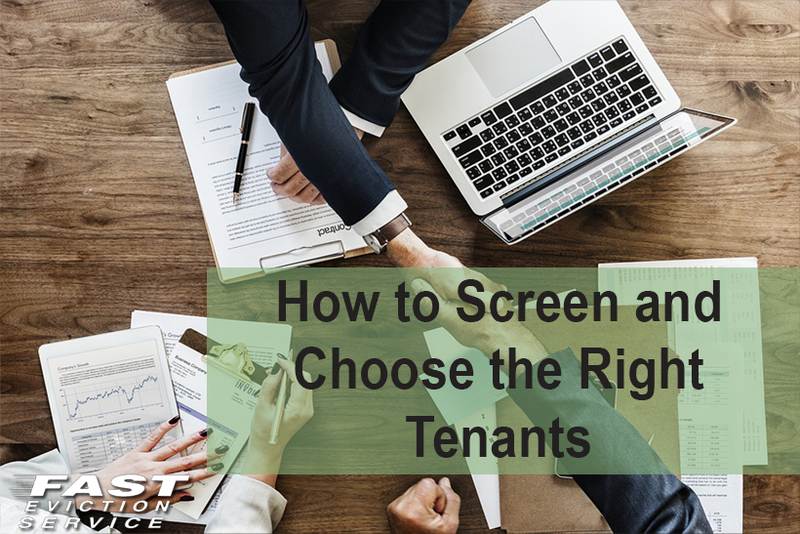 Finding, screening and choosing the right tenant is one of your very most important responsibilities as a landlord and better to put the necessary time and attention to checking references and details before making a hasty decision that will prove to be a landlord rental mistake that will come back and haunt you in the future.